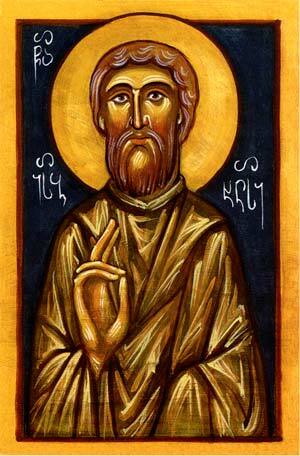 Little is known about the life of St. Joseph of Khevi. The Church is certain only that he was a native of Khevi (in northern Georgia) and served as a priest in that village. In addition to being great warriors, the people of Khevi have throughout history been remarkably steadfast in the Christian Faith. The churches and monasteries in Khevi are extraordinary in both beauty and inaccessibility. They were deliberately built in mountainous places, as if reaching them should demand the greatest of zeal. The most important ornament and symbol of Khevi is the ice that perpetually caps the peak of Mt. Kazbegi. On the slope of this mountain stands Trinity Monastery, where at one time St. Nino’s cross was preserved (it is presently kept in Tbilisi, in the northern section of the iconostasis at Sioni Cathedral). The historian David Batonishvili records that St. Joseph was especially known for his love of holy objects, for keeping the strictest of fasts, and for his outstanding virtues. He climbed to the Bethlehem Hermitage and returned with a piece of the tent of the patriarch Abraham, (Georgian tradition relates that both the tent of the Patriarch Abraham and the manger of Christ were kept in the Bethlehem Cave for many centuries.) which he presented to King Erekle. Having attained the heights of clairvoyance and miracle-working, St. Joseph reposed peacefully in the year 1763.